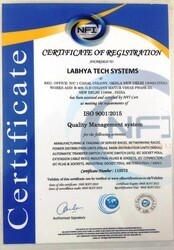 Incepted in the year 2013, Labhya Tech Systems is one of the standard establishments who is entirely engaged in Manufacturer and trader highly effective range. The complete variety consists of Server And Networking Racks, Power Distribution Unit, Rack Accessories etc. Our products are designed by using premium quality raw material that made accessible by the trustworthy merchants of the market. Moreover, the delivered array of products is best for its qualities like optimal finish, reliability, lasting nature, shockproof and enhanced designs. One can acquire these in diverse requirements and as per their demands. Under the leadership of our mentor, Mr. Pushpender Singh we have been proficient of holding top position in this competitive era. His widespread knowledge and skills of this field has aided us to gain a step in front from our competitor companies in the market. We are a prominent association who are capable of offering valuable customers finest quality range of products. Before final deliverance of our products, we first check our entire range of products on a variety of quality restraints, which is executed by the qualified team of professionals who have immense knowledge and information of their field. This personnel has the capability to put on and comprehend their clients demand in a right manner. Also, we have gained an appreciation for quick delivery of these products.